← I want to publish my book, too! 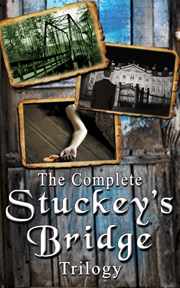 This entry was posted in "Stuckey's Gold: The Curse of Lake Juzan", "Stuckey's Legacy: The Legend Continues", "The Complete Stuckey's Bridge Trilogy", "The Legend of Stuckey's Bridge", authors, books, Cover Reveal, historical fiction, history, indie authors, Kindle, Mississippi, My Books, writing and tagged books, halloween, kindle, new releases, thriller, writing. Bookmark the permalink.